UAE prepares for the historic visit of Pope Francis and Grand Imam of Al-Azhar … reports Asian Lite News. 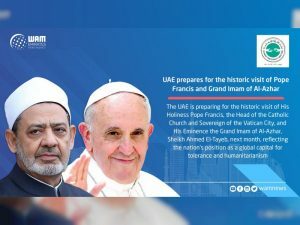 The UAE is preparing for the historic visit of His Holiness Pope Francis, the Head of the Catholic Church and Sovereign of the Vatican City, and His Eminence the Grand Imam of Al-Azhar, Sheikh Ahmed El-Tayeb, next month, reflecting the nation’s position as a global capital for tolerance and humanitarianism. The landmark visit marks the first time a Pontiff has visited the GCC, and is the first time any Papal visit has coincided with a religious figure as significant as the Grand Imam. It comes after His Holiness, Pope Francis and His Eminence the Grand Imam accepted the invitation of His Highness Sheikh Mohamed bin Zayed Al Nahyan, Crown Prince of Abu Dhabi and Deputy Supreme Commander of the UAE Armed Forces. His Holiness, Pope Francis, and His Eminence, the Grand Imam, will also meet Sheikh Mohamed bin Zayed Al Nahyan for bilateral meetings and discussions. In the 47 years of the UAE’s existence, the nation has been proud to promote coexistence among its multinational population and hosting this visit and its commitment to human fraternity is a testament to the nation’s ongoing doctrines of peaceful coexistence, tolerance and human values, driven by open interfaith dialogue. The joint visit is a highly significant occasion for the UAE in 2019, which has been declared the ‘Year of Tolerance’ in the UAE, to further strengthen the nation’s role of encouraging stability and prosperity in the region. The Year of Tolerance follows the Year of Zayed in 2018 and the Year of Giving in 2017. The UAE has a long and proud history of interfaith dialogue and freedom of religious expression and the first Catholic Church in the country was established in Abu Dhabi in 1965. Archeologists have also found remains of a church and monastery on Sir Bani Yas Island dating back to the 7th century.